For the longest time, I thought Chicken Cordon Bleu was such a fancy meal. This belief even kept me from trying to make it. In college, Dustin used to make it for us. Even watching him, it seemed like it required some intricate method and dedication that somehow eluded me. Probably because of the fancy schmancy French name. 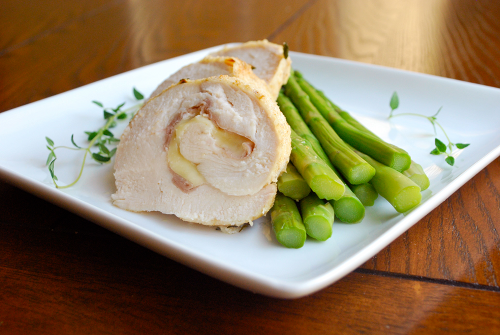 Do you know what “Chicken Cordon Bleu” even means? I didn’t. “Cordon” means “ribbon” in French and “Bleu” is the color “blue.” So, “Cordon Bleu” essentially means “Blue Ribbon” and “Chicken Cordon Bleu” means a chicken dish awarded for its excellence. Interesting, huh? Didn’t think you’d learn some French here today, did ya? Heehee. Last year, I finally tried my hand at making it. And, you know what? It’s really not that hard to make. In fact, it could easily be a weeknight dinner. Seems silly I waited so long to make it. If you look around the blogosphere, you’ll find most Chicken Cordon Bleu recipes differ on three major elements: (1) Swiss versus Gruyere versus Monterrey Jack, (2) Prosciutto versus Good Ham and (3) Bread Crumbs versus Panko. In my opinion, they all taste good. But, that’s just me and my gluttonous food-loving ways. I’m silly like that. This particular recipe is written for my preferences, but feel free to choose whichever options you like. I usually drizzle Hollandaise over the chicken and asparagus, but I wasn’t up to it this time. I’m, unfortunately, still cleaning up bits of Hollandaise in my kitchen from a mishap with the blender a few months ago. Ugh. If you’re interested, though, Alton Brown has a delicious recipe I often use and it goes great with this Chicken Cordon Bleu meal. You might even say it’s a Hollandaise Cordon Bleu of sorts. Ha! Don’t let the fancy French name fool you, this Chicken Cordon Bleu recipe is simple and delicious and could easily be a weeknight dinner. 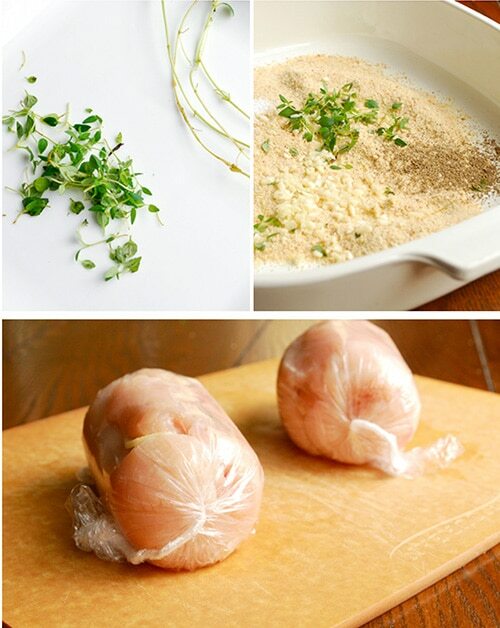 Lay the chicken between 2 pieces of plastic wrap. Using the flat side of a meat mallet, gently pound the chicken to 1/4-inch thickness. Take care not to pound too hard because the meat may tear or create holes. 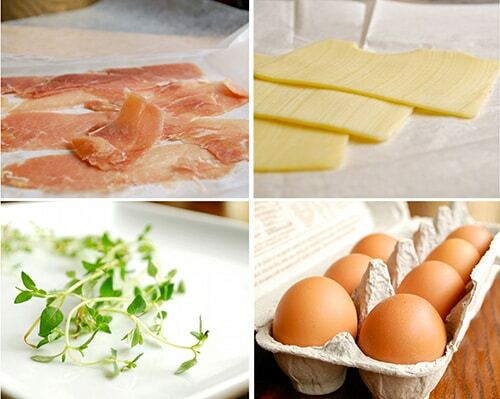 Lay 2 slices of Swiss on each breast, followed by 2 slices of prosciutto and then 2 more of cheese. Try to leave a 1/2-inch margin on all sides to help seal the roll. Tuck in the sides of the breast and roll up tightly like a jellyroll inside the plastic wrap. Squeeze the log gently to seal and twist both ends tight. Repeat with the remaining chicken. Season the flour with kosher salt and pepper and spread in a flat dish. Mix the breadcrumbs with thyme, garlic, kosher salt and pepper. Beat together the eggs and season with kosher salt and pepper. Remove the plastic wrap. Lightly dust the chicken with flour, then dip in the egg mixture and then gently coat in the bread crumbs. Lightly coat a baking pan or dish with olive oil and carefully transfer the roulades. Bake until browned and cooked through, about 20-25 minutes. Cut into pinwheels before serving. Serve with steamed asparagus and drizzle with Hollandaise, if desired. We use to love this. Need to make it again. Lacey, thank you so much for this recipe. It was very easy to put together and it turned out beautifully. My sweetheart was so impressed! I fully intend to share this link far and wide. Many, many thanks! How do you keep them together without toothpicks? And do you tuck the ends in first before rolling? Lexi, when I’m rolling them into the saran wrap, I make sure to do it really, really tight so it stays together. I’ve never needed to use toothpicks. Before, rolling, I do tuck in the ends and any stray pieces to make them as uniform as possible. Thanks for clarifying! Thanks for the tip, Harvey! I prepared this recipe with a mix of Oaxaca and Muenster cheeses. I also added some roasted rosemary, tarragon and garlic. Was absolutely delicious! Yum! Love the additions you used. Thanks for sharing. Oh, it also took an hour to cook the chicken all the way through but I had 7 breasts in the oven. Thank you so much! 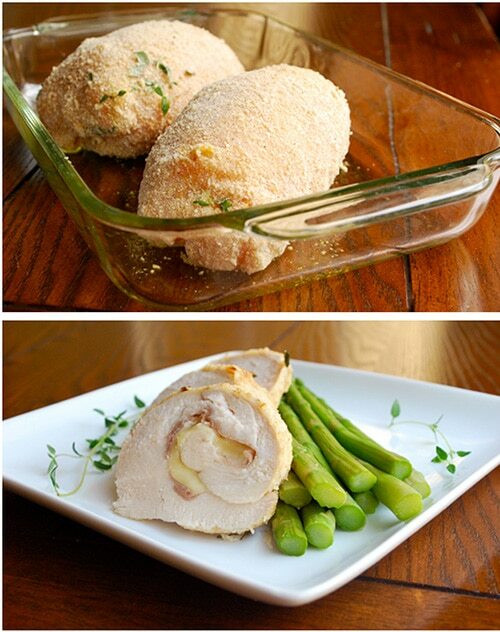 I came across your website while in search for a chicken cordon bleu recipe and I am in love! We had a dinner party with 10 guests last night and this was the most perfect entre. I prepared the chicken the night before and then just before everyone arrived I did the egg/flour/bread crumbs. I also made your bruchetta and I’ll be forwarding a number of our guests links to your recipes because they loved it so much. Thank you – you were a huge help to making the party a success!! Hmmm…that is weird. I’m sorry to hear you had trouble with the recipe, Anthony. For how long did you need to bake them? Thanks For the Recipe, I cook my boyfriend dinner a fairly good amount. It was good to come across something that was so simple but the end resualt looked like it took hours to make. It was very good!!! Thanks again. i have attempted this dish a couple of times before. I have ended up with dry chicken or serious trouble breading. yours looks soooooo appetizing. i will have to give it ago once more! Hey Donald! I hope you do give it another try. This dish usually comes out nice and moist, but I’ve had trouble with other cordon bleu recipes in the past being too dry also. Good luck and thanks for commenting! this looks great! Will definitely have to add it to my menu next week. Hi Emi! So happy to hear from you! I hope your trip went/is going well. Are you back now? My mom used to serve us a frozen cordon bleu that she bought in the supermarket. I never loved it but knew that it held such promise. I haven’t made it yet but your version looks delicious! what a perfect cordon bleu! your images are outstanding….I am so happy to have found your blog! Hi Chef Dennis! Welcome and thank you! I used to think the bleu was for blue cheese…but I didn’t realize that it has no blue cheese in it until the 3rd time I made it. lol Thanks for the lesson!! Hi Tara! Hilarious. I fight that all the time too. It just sounds like it should have bleu cheese IN it, right? Thanks for sharing! Wow- I always thought it was much more complicated than that. Thanks for your excellent instructions. 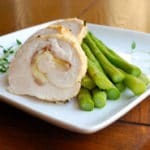 We eat a lot of chicken, and it’s always great to learn new ways to prepare it!